Local builder SureGreen is hosting a public open house on 23-24, 2010 for the first quad certified green home in PA. This amazing house is certified LEED Platinum, NAHB Emerald, Builders Challenge and ENERGY STAR. It features solar panels for power, geothermal for heat, stunning architecture and a few fun features like an indoor climbing wall and outdoor waterfall. I took a few pictures of some of the features that I loved, but they don't really do justice to how gorgeous this house is. Front Door is a spectacular piece of art created by the Late John Metzler from Urban Tree Forge. Sink top in half bath looks like a forest of trees and leaves. Stop by and check it out to see how green technology can be integrated into, and enhance, any home. The home is located at 549 MacLeod Drive in Gibsonia, 15044. Office is on third floor with a wall of windows and cork flooring. This would be a great place to work. I specialize in helping my customers buy and sell homes in the Pittsburgh area that are good for their wallet, health, family and planet. 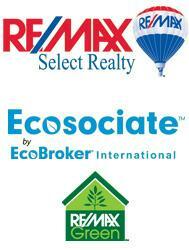 Christa Ross, Ecosociate and RE/MAX Green Specialist. Call me at 724-933-6300 x214 (office) or 724-779-1437 (direct) or visit my website at www.greenhomespgh.com.